The Good Ole' Days! Time for that campfire feeling podcast. Adam throws it back old school and seeks the counsel of one who has seen and experienced the most change. 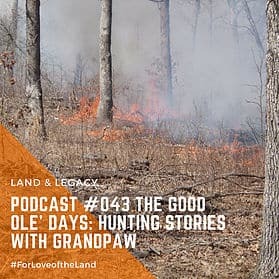 Adam's grandpa, Junior McVay, is a long time resident of southern Missouri who spent most of his life working with farmers but his passion was quail hunting. Over the years he has seen changes across the landscape that he calls, home. This week he shares about those changes and how it has altered the habitat for many different species.